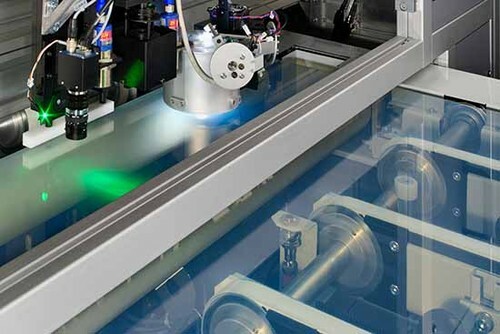 The SenSol mapping system is designed for thin film metrology at every location on the panel, especially at the edges. TCOs can be investigated for homogeneity in thickness, sheet resistance, spectrally resolved haze H Haze in transmission at 600 nm(λ), reflection R(λ), and transmission T(λ). Running-in times for new deposition processes or after cleaning the deposition systems are significantly reduced. for VIS or VIS / NIR Haze sensor 4-point probe sensor Camera Ellipsometer Raman can be integrated into the SenSol sensor platform. That allows for particularized process monitoring giving the opportunity to compensate process drifts. Oerlikon Solar, Switzerland, a leading provider of thin film metrology equipment for PV and one of SENTECH key reference customers, ensures excellent production results by process monitoring with SenSol. SENTECH easy-to-use, recipe oriented SenSol mapping software offers a flexible and customized interface to the manufacturer host computer as well as customer specific graphical representation of the actual thin film metrology result.